Before you return from your business trip, I wanted to write to let you know about a tiny little accident I had with the pick-up as I was trying to park it in the garage. Luckily nothing serious happened, I was not injured, please do not worry about me. I was just returning from grocery shopping. As I turned into our driveway, instead of the brake, I stepped on the gas. 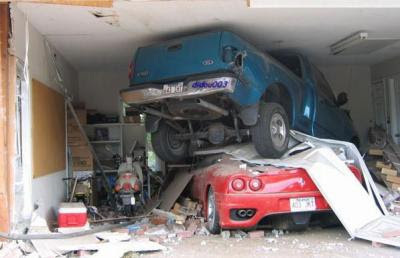 The garage door got slightly dinged but fortunately the pick-up stopped immediately after jumping up on your Vette. I am very sorry about that, but I am sure you will find it in your kind heart to forgive me. You know how much I love you, baby! I am attaching a photo about the minor scratch on your car. I can hardly wait until I can hold you in my arms!